Hearts defender Demetri Mitchell has confirmed he won’t kick a ball again this season after suffering a knee injury. 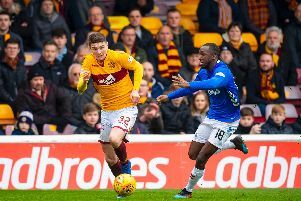 A scan confirmed the on-loan Manchester United youngster had damaged the lateral meniscus in his knee during the William Hill Scottish Cup fifth round win over Auchinleck Talbot last weekend, and the 22-year-old updated fans on social media to confirm his season was over. “Took a few days to sink in but unfortunately my season’s been cut short sand I won’t play again this season,” he wrote on Instagram. “These things happen in football but I had a great 12 months at Hearts - ups and downs and met a lot of friends in the process. “Thank you to the fans, you were great, and all the staff who helped me too. It’s been a pleasure. His Tynecastle team-mates were quick to lend their support, with Callumn Morrison writing: “All the best bro” and Anthony McDonald, currently on loan at Inverness Caledonian Thistle, adding: “All the best mate”. Mitchell made 33 appearances for Hearts, scoring twice.